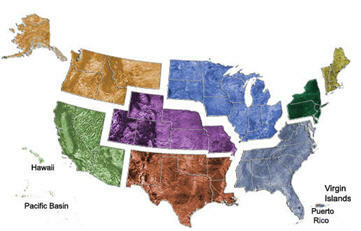 No matter where they live or work, health professionals, researchers and the public can access information from the National Library of Medicine thanks to its National Network of Libraries of Medicine (NN/LM), consisting of more than 6,000 libraries coordinated by the NLM and supported by eight Regional Medical Libraries (RMLs). NLM in Focus is showcasing the libraries awarded contracts to serve as RMLs for 2011-2016. In this article we introduce you to the people and projects of the South Central Region (SCR). Houston, the largest city in Texas and fourth largest in the country with 2.1 million people, is home to the NLM’s South Central Regional Medical Library (SCR), located at the Houston Academy of Medicine-Texas Medical Center. Covering Arkansas, Louisiana, New Mexico, Oklahoma and Texas, it serves some 39 million people clustered in major urban centers like Houston, Dallas and San Antonio, but also scattered across remote areas in a vast, diverse region. The SCR, in its mission to improve public health by increasing access to biomedical information, supports 16 regional resource libraries, 378 hospital and 194 academic libraries, 270 public libraries and 230 other organizations. These include associations, public health departments, state libraries, community- and faith-based groups, and schools. 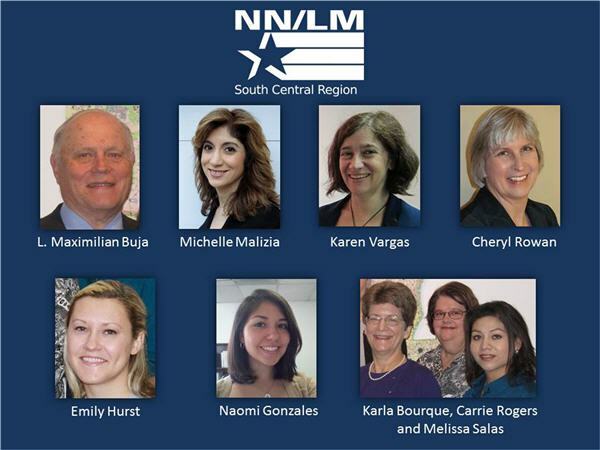 NLM in Focus spoke recently with SCR’s Director, L. Maximilian Buja, MD, and Associate Director Michelle Malizia. The South Central Region is one of dramatic geographic contrasts, of major population centers and large, sparsely populated rural areas. Some 70 percent of the population resides in Texas in three of the country’s top-10 largest metropolitan areas, Dallas, Houston and San Antonio. 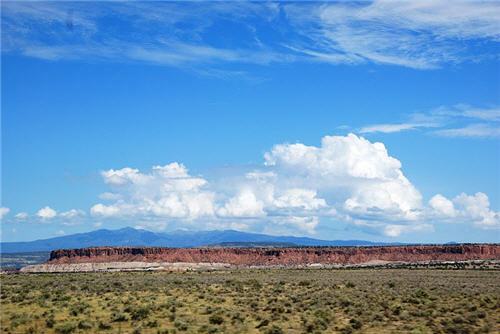 The rest are spread across some of the most remote, isolated regions in the United States, with long distances and lengthy travel time challenging the provision of services of any kind. In Arkansas, for example, 45 percent of the population is rural. Poverty is another issue. According to the US Census Bureau, five of the country’s poorest cities are in the SCR, including Brownsville-Harlingen, TX (#1); McAllen-Edinburg-Mission, TX (#3); Monroe, LA, (#7); Fort Smith, AR-OK, (#9), and Pine Bluff, AR (#10). New Mexico has the highest percentage of Native Americans in the country, and Louisiana’s African-American population is more than twice the national average. These challenges are not unique to our region, but there is a digital divide that runs throughout the country where access to computers, online information, and computer resources is limited in some locations and populations. For example, people tend to think there are limited computer resources in rural locations. That’s true. But there are also quite a few poor urban neighborhoods that don’t have these resources. To solve the problem, we purchased a portable computer lab and have four coordinators who travel widely to provide computer training and teach people how to access online health classes. We fund specific projects, too. For instance, currently we are working with the Texas Area Health Education Center (AHEC), a non-profit group that seeks to improve the health of the greater Houston population, especially the underserved. 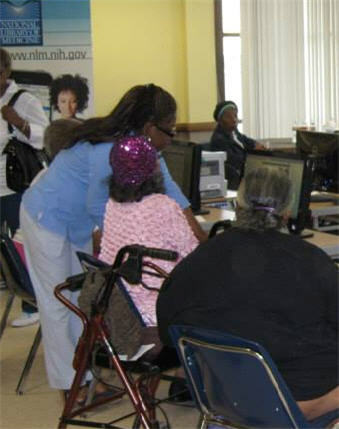 The project offers computer literacy and health information classes at senior centers, in mainly African American communities. Seniors receive three-hour coaching sessions on the MedlinePlus and NIHSeniorHealth Web sites. Also as part of the project, the Texas AHEC East initiated Houston’s first Internet café for underserved seniors. Because we travel so much and our region is so big, we have to be cognizant of the weather. We need to be very flexible with our scheduling because, at certain times, New Mexico can have snow while a hurricane may be barreling through Louisiana and Texas. We are very proud of our Library Student Outreach Awards. Now in their fifth year, they are a phenomenal success at promoting the value of outreach to tomorrow’s health science librarians, many of whom go into library outreach projects as a result. Award-winners attend the South Central Chapter of the Medical Library Association (SCC/MLA) Annual Meeting. They participate in meetings, conference sessions and other activities, learning firsthand about the importance of health information outreach and the services provided by librarians in the South Central Region. The also staff the SCR exhibit and give in-booth demonstrations. We are also very involved in training people about the Affordable Care Act, trying to help them understand its requirements and possibilities. Our YouTube video, “Public Libraries and First Responders: Partners in Emergency Response,” is another good example of our partnering with public libraries. It shows how libraries are vital to life of a community and can play an especially important role during and emergency or disaster. We’ve been very active on social media including Twitter and Facebook for several years. We honed our skills, learned what our audiences like, and engage them in ways that have a positive impact on their use of social media. Our information is re-tweeted and shared across the region, so we must be doing something right. And that’s always a good feeling. I believe we were among the first RMLs to explore the YouTube’s possibilities. We created and posted a number of them early on, and continue to produce and post ones that support our online classes. Through the SCR Blogadillo, we provide topical updates to our network members, now more than 600-strong. The blog is a quick and easy tool for distributing the latest relevant news and information across the region. The SCR also provides training sessions on the latest technologies. For example, one of our most popular is “Tablets and e-Readers,” which offers hands-on use of mobile devices and e-readers. Another, “That’s a Wrap: Creating and Editing Video Content,” walks viewers through the steps of producing a complete video. Our traveling computer lab is a good example of taking technology to the people who need it most. It’s fully functional, easy to set up, and use quickly. We began using it in the aftermath of Hurricane Katrina in 2005 to bring good health information to residents of New Orleans who desperately needed it. Of course, we still use the old-fashioned telephone to keep in touch, especially in areas with limited Internet. We partnered with Hydro, OK, a remote, sparsely populated town of 969 people (2010 Census) to sponsor a disaster preparedness program involving the community, the Hydro Public Library, and the Hydro Fire Department. We taught first-responders how to access MedlinePlus and WISER from the field through mobile devices. In addition to providing disaster preparedness training, the goal was to plan how to use communications technology to link the department, the library and the community during emergencies. We have partnered with the Cherokee Nation, in Oklahoma, to train medical and nursing staff on how to use iPads to access mobile databases and websites such as MedlinePlus and PubMed at the point of care, and to upload and view brief Cherokee-language health education videos. We also helped the Santa Fe Indian Hospital staff develop a culturally relevant curriculum on suicide awareness and prevention using the PubMed and MedlinePlus sites for information on creating community-based suicide crisis response teams. Our goal is to provide awareness and access to quality health information and technology and to help current and future information professionals develop their skills so they too can help promote NLM databases. There are so many great NLM resources, many of which people are completely unaware of. So we see our job as helping increase their awareness so they can make informed health care decisions, for themselves, their patients and their research. January 23, 2014 in NLM Departments, Programs & Services.